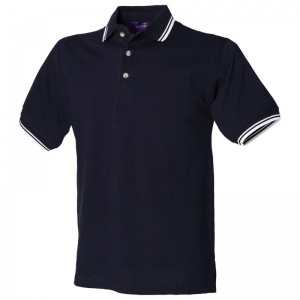 Double row tipped polo. Classic 3 button placket with plain horn buttons. Stand-up collar for increased shape retention. Side vents for ease of movement. Hemmed sleeves. Locker patch. Contrast tipping detail on collar and cuffs. S - 36" M - 38/40" L - 42" XL - 44/46" 2XL - 48"